Using external controls to manage report properties - Fast Reports Inc. This article aims to explicate the concept of work with a report via the Web form controls in the project ASP .Net MVC. 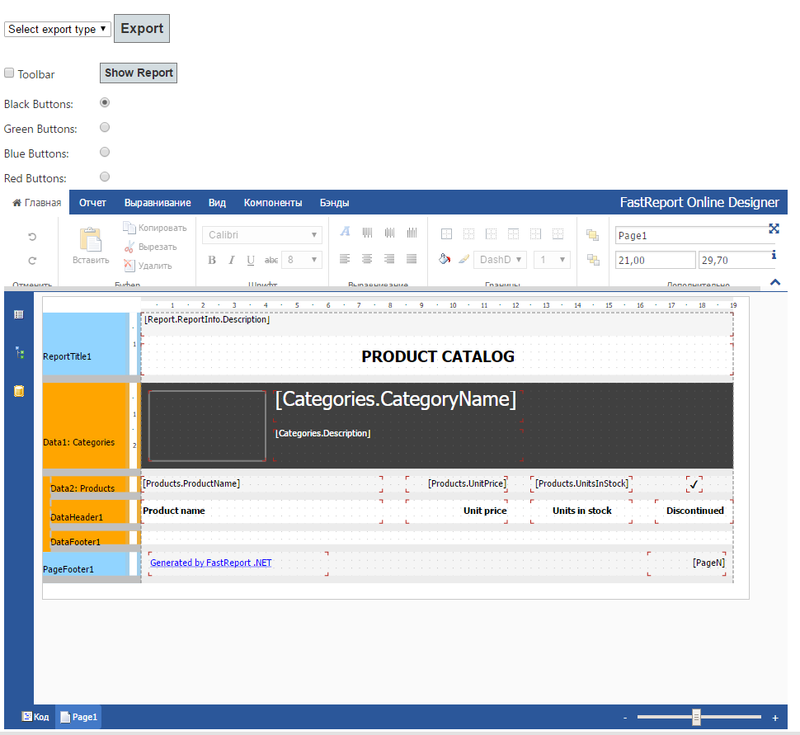 5) run the report in the Online Designer. Let us proceed. 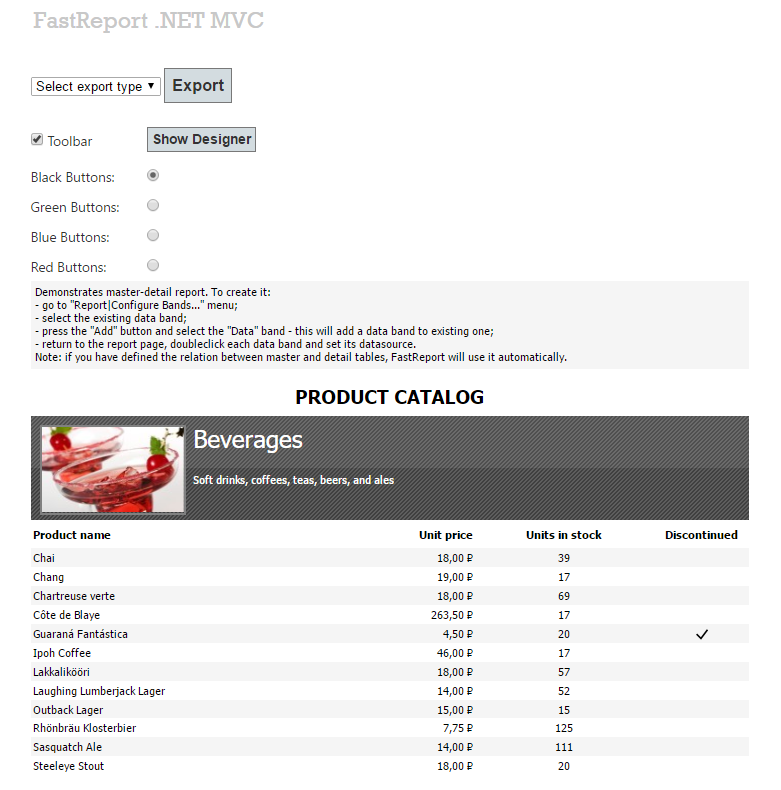 To begin, do some preparatory work to start in MVC web application report. Add a reference to the following libraries: FastReport and FastReport.Web. Add logic of the report in "HomeController". We will upload the report and transmit it to twist in the Index method. I have downloaded the report in a separate method, which will be discussed below. Now set the width and height of the web report 100%. With the help of "ViewBag" pass on the report to overview it. Then, return the presentation "Index". To use a report object in different methods I have created a global variable – an instance of the WebReport object. Set the path to the folder with reports. For my convenience, I have created a single method of assigning a variable of the path to the reports. 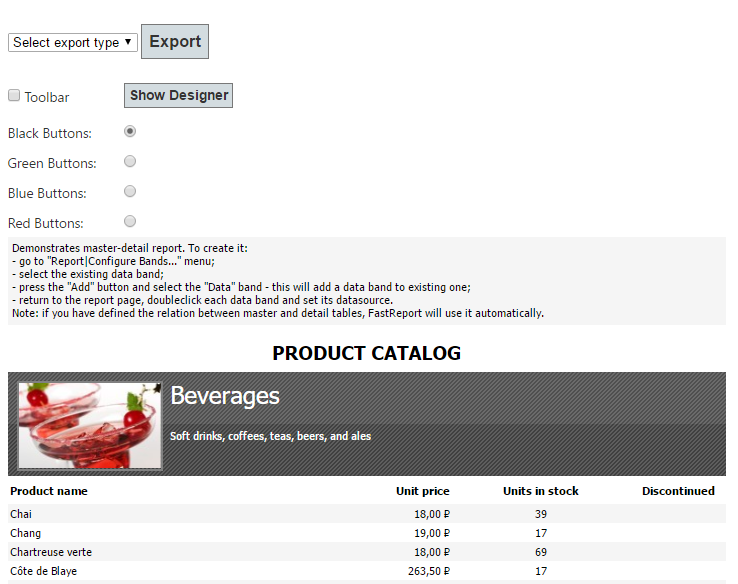 Next, create an instance of the "DataSet" and load XML database into it. Then, register the data source in the report object. Finally, load the report template into the WebReport object. Here we load a report. Depending on the value of the type parameter, we perform one of three types of exports. Now open the view "Index". Here we have used an html helper to create a form, that refers to the controller "Home" and action (method) "ReportExport". As you remember, we have already established such a method in the controller. Inside the form we create a DropDownList control, and fill it with values. Of course, it was possible to create a data model. However, since the list consists of only three elements, I filled it right in the presentation. After the drop - down list is opened,there a button of the submit type will appear, which will be updated on the web page. As you remember, the ReportExport method takes a parameter "type" - a value from the drop - down list. The report will be exported in an appropriate format depending on the selected value. As in the previous example, we create a form. However, this time we specify the action "Index", where we have displayed the report. Inside the form we have created a CheckBox element. Its value we will transfer to the "Index" method. This time I decided not to add another button to refresh the page. I used the the event "onchange", which has the function of a sending form "this.form.submit ()". Now, the page will be updated when the checkbox value changes. We have added a parameter and a condition. In dependence to the paramenter of the toolbar we decide whether to enable or disable it. Here is the name of the control - "Radio". That is how one more parameter in the action movie "Index" will be called. Next parameter - "Black Buttons", when black buttons appear on the toolbar. The next value indicates whether a selected radio button will be marked by default or not. The last parameter is the object "HtmlAttributes". Here you can choose any of the available attributes for the tag <input type = "radio" />. I took advantage of this and specified the width of the control and the "onchange" event by analogy with the previous element "checkbox". Now add another one parameter - "radio". I have used the structure "Switch" to assign a desired style, depending on the radio. Let us allocate the processing of parameters "radio" and "toolbar" into separate methods. 5) The only we need is to realize conceived function - to run the report in Online Designer. It must be mentioned, that you need to get the assembly "OnlineDesigner" from the developer's website and include it in the project. Just unzip it and add the whole WebReportDesigner folder to the project root. The form will be submitted by pressing the button. Notice that the attribute value is determined through "ViewBag". We pass the button value from the control. It will be explained later why it has been done. The onclick event has been assigned for the button. Now I assign a value "Hidden" to the element in it. Please note, that due to "ViewBag" I get the value of the Web report. Thus, if the page shows the Report Designer, the value of the hidden field is "true", otherwise it is "false". Now we proceed to the controller. As you can see, another parameter has been added in the method "Index". Its name is the name of a hidden item in the View. Also, the following line has been added: «ViewBag.Result = ShowDesigner (dsg);». I gave the button name to the view in this line. 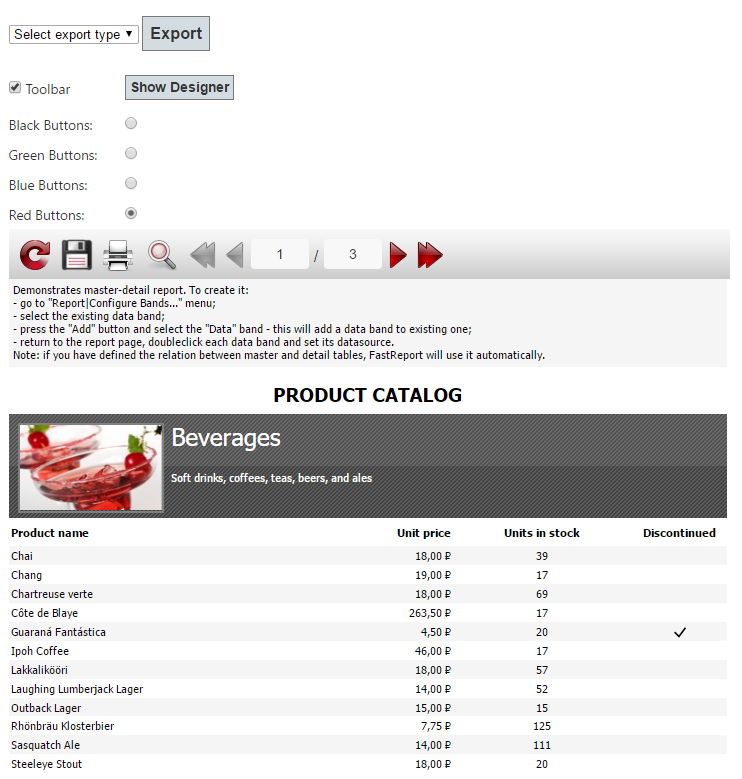 A new method "ShowDesigner" enables or disables report designer and returns the name of the button. In this the external controls have been created and examined, by means of which we can manage properties of a WebReport object in ASP .Net MVC application.